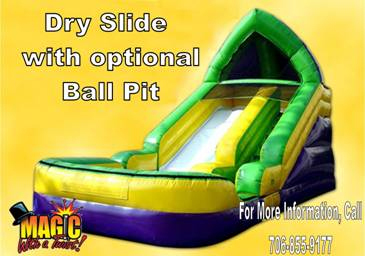 The Dry Slide is a super inflatable from Magic With A Twist. This slide is 13� wide by 26�long and 15� 6� tall. Feel the adrenaline rush while sliding down the slope of this giant slide! This slide offers you bigger thrills without sacrificing safety. A screen at the top keeps the kids safely sliding down instead of jumping off the top. For added safety, this super slide has a 10' by 10' catch area with a new state of the art foam padding system in the bottom for soft landings. Add colorful balls to this area to make a real crowd pleaser! This slide is suitable for ages 5 and up.